Last summer I took my laptop on a trip from the U.S. to Austria. It is an Alienware (Dell) and the power cord has a ground pin and is rated 100-240V, 50-60Hz. I used an adapter to plug into the C European electrical socket. In both hotels I stayed at I flipped the breaker to my room while using my laptop. I thought there would be no issue since the laptop was rated 100-240V. What could have caused this and how do I prevent it in the future? I am going back to Austria and Italy this summer and do not want the same thing to happen again. I only had one adaptor, so I couldn't try any others. I charged my phone and tablet through it with no problems. It came from Target. To add additional information, the breaker did not trip immediately. In the first hotel it happened after about 30 minutes of using the laptop and at the second one it happened after a couple of hours of use. Does that make a difference? As I mentioned in the comments, my power cord has a ground pin and the adapter was for a Type C outlet so the ground pin did not go into the adapter. I'm also certain it was being plugged into a type F outlet, which is grounded. A breaker tripping is a serious sign of trouble. Something shorted or started to draw excessive current. If not for the breaker, it would probably have caught fire. (Or the circuit was already overloaded - but since it happened in two different places, that seems unlikely.) So this is a safety hazard if not resolved. Since it doesn't happen normally, I think the most likely suspect is the plug adapter. They're often cheaply made, and I could imagine that a manufacturing defect, or damage from rough plugging and unplugging, could give you a situation with an intermittent short. So I would start by replacing the adapter with one of known good quality - look for certifications. And be careful not to damage it. Then if it happens again, I would suspect the laptop's power cord or power supply, and replace those. And until you are confident the problem is resolved, I would suggest keeping an eye on the laptop, and not leave it plugged in when unattended. It looks like your laptop is tripping the RCD rather than the regular circuit breaker: a device tripping the regular CB will simply start smoking if the CB doesn't trip, and your laptop seems to work in some places. AFAIK RCD protective devices are mandatory in hotels in the EU. While this is sometimes due to the power supply design and not an actual problem, it's better to be safe than sorry. Chances are, your PSU is leaking current from high-voltage part into the low-voltage circuitry, putting you at risk. This may be not noticeable while the current is low, but the danger is that it can increase unpredictably. The cheapest step to take is to replace the power cord. If that doesn't help, get the power supply checked by a repair shop, or buy a new one. People sometimes suggest to get a power cord without protective earth pin, which indeed will get your power supply working, without tripping any protection. Don't. When the power supply will die of old age, you will have no residual current device to protect you and rely solely on your health to sustain the electric shock. I have a gaming Laptop too and live in Austria. The switched power supply provided with my laptop seems to have an extremely high inrush current. This is in general common for such power supplies, but the one provided with my laptop is extremely bad. Breakers have different characteristics and it takes them a different time until they flip. In one part of my parents home there is a older electrical installation, and I can't plug my laptop in there without flipping a breaker. The rest of the house has newer electrical installation, and there it works. I also have an DC-AC converter rated 500W for my car. My laptop power supply is rated 300W, so it should work. I cannot connect my laptop to this, it immediately trips some internal breaker. Just for fun and to confirm my suspicion I connected a UPS in between. So Converter -> UPS -> Laptop power supply. This works. After I found the reason is indeed the inrush current of the power supply I bought a generic 350W power supply which is compatible with the laptop. This one seems to be of better quality and has none of this problems. So I believe the most likely problem is, that your power supply just draws to much current when powering up. I agree with all other answers and I would pay a lot of attention to the security things, but just to add a small thing that could have been overlooked: at least in Italy it's not uncommon for hotels to not allow the use of any electrical appliances at all, or sometime to allow only a cellphone charger or an electric shaver. In the first case you'll not find any plug in the room, in the second case you'll simply have the room spare plugs connected to a different breaker: it's entirely possible that an Alienware, at boot, would trigger it. It's probably a ground fault. You want to know - in America - whether your laptop power supply has a ground fault, so you can get it fixed now. Easy to test. In the United States, find a GFCI protected circuit, found in the newest kitchens, bathrooms, garages, laundry rooms, etc. You can also install a GFCI that replaces a receptacle, they cost about $20. Europeans call it an RCD, for residual current. Same thing. Plug into the GFCI and see if it trips. If it does, it will trip a European RCD. Don't fool around with ground faults, especially if you travel. Your bad power supply can combine with a hotel's old and faulty electrical service to shock you. GFCI/RCD compare current flow on both conductors - they must be equal or current is leaking somewhere to a third path (usually to a safety ground, which requires a ground - that can't happen with a 2-prong plug. Sometimes another way, e.g. through a human.) By nature, they trip instantly (well, 8-10 milliseconds) because a goal is life safety. GFCIs are uncommon in American homes, but very common in Europe. Europe protects the whole dwelling with a low sensitivity unit (30 milliamps). America protects only high-risk rooms with a more sensitive unit (8ma), and it's easier to distinguish whether it was an overload trip or a GFCI trip. If it's not a ground fault, it must be an overcurrent trip. You say in a comment elsehwere that the trip was instant, not even 1 sec - that means if not RCD, the breaker must be operating in magnetic-trip mode (not delayed thermal trip). Magnetic trip requires massive overload on the order of 150A++ (30++kw). It's difficult to believe that would not have noticeable effects like arc flash, audible report, notable heat, burnt plastic smell, visible damage. As such I consider it unlikely and suspect RCD. If the problem does turn out to be an unreliable plug converter, you don't necessarily need to buy yourself an expensive, high-quality replacement converter. If the laptop power supply has a mains socket (rather than a hard-wired plug or cable) you can swap out the mains cable itself: buy or borrow a European mains cable and use that instead of the US cable. 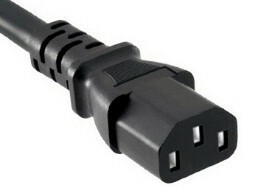 From some googling it seems that Alienware laptop power supplies use the very widespread C13 connector. Did each hotel room have its own breaker? The variable and long delay before tripping sounds like it tripped when someone else added a load to the same breaker. I've seen it happen when someone puts down toast while a microwave oven is on, or starts a hairdryer while someone else is vacuuming. Could even be something in the same room that is intermittent, like a thermostat-controlled heater, or a refrigerator. It might come on, but you don't hear it because the breaker immediately trips. Not the answer you're looking for? Browse other questions tagged europe electronic-items power or ask your own question. Moving from US to South Korea, what surge protectors can I buy?